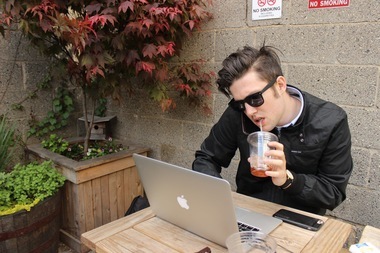 DNAinfo reporter Noah Hurowitz hard at work at the West Coffeehouse in Williamsburg. Spring has sprung and for all you freelancers out there that means your looking for a nice tranquil place to work where you can catch some rays at the same time. As reporters, we've got a lot of personal experience in this field and we've compiled a list of some of our favorite spots in Brooklyn where we can get tasty coffee and strong Wi-Fi signal all on a pleasurable patio, backyard or garden. Búdin offers earthy coffee, dainty snacks and a big and tranquil patio space that gets plenty of Wi-Fi and sun all afternoon. There are even outlets outside if you need to recharge. They’ve got a big indoor work space as well. Kave's big patio has plenty of sunny and shady spots. Located inside the Loom building, they've got yummy coffee and sandwiches. Gnaw on Schmackary's scrumptious cookies — from chocolate covered pretzel, oatmeal, caramel delight, to blueberry cobbler, in their refreshingly tranquil backyard. Enjoy their dank coffee, avocado and apple butter toasts and grilled cheeses or creamy cold brew on tap, while you lounge in the West’s sprawling patio, that even has it's own Wi-Fi network. ►Brooklyn Kolache Co., 520 DeKalb Ave. Try some sweet or savory Texas-style Czech pastries while you get some work done, with choices like sweet cheese, apricot, peanut butter and jelly, spinach and feta, or sausage, jalapeño and cheese. There are big tables indoors with several outlets to hunker down with your laptop and cup of coffee, or you can bask in the sun in the backyard where there’s plenty of seating and umbrellas. ►Daily Press Coffee, 505 Franklin Ave. Kick back with some beer or wine and grab a burrito at Daily Press. The partially-covered backyard gives some protection from the rain. There are fans to keep you cool, and there’s heating for when the temperatures drop. It can get a little noisy once the local schools let out and students stop by for a bite, but despite the rush, you can get plenty of work done. ►Kava Shteeble, 94 Ralph Ave.
Kava Shteeble offers great pastries and ample seating indoors, where you can play board games with friends while you take a break or lounge on the couch. Outside, there’s room to work and chat by a fire pit, for when those summer nights get a little cool. ►Brewklyn Grind, 557 Myrtle Ave. Enjoy savory pastries, sweet treats and a variety of coffee brew styles while working at one of Brewklyn Grind’s large outdoor picnic tables. Friendly staff will let you linger on the coffee shop’s free Wi-Fi network. ►Outpost Cafe, 1014 Fulton St.
Post up at Outpost Cafe’s whimsical outdoor garden where vine-covered walls, gnarly tree trunks and overhanging greenery can shade you from the harsh summer sun. Cozy up in your choice of eclectic patio furniture or spread out on a picnic table. The cafe has free Wi-Fi and offers sandwiches, salads, a variety of coffee and teas, plus beer and wine for the after-hours. ►Pillow Cafe Lounge, 505 Myrtle Ave.
Start the day right with a hearty breakfast and free Wi-Fi at Pillow Cafe, which has a large outdoor patio and plenty of comfy, pillow-lined indoor seats. Keep it simple with a basic egg scramble or big with an order of bacon cheddar waffles with a side of eggs and fruit. Towards happy hour, this place gets too packed to do any meaningful work, but during the day, wide tables, lots of good lunch choices and a small, sunny courtyard off the cavernous beer hall and food court makes this a nice spot for the laptop set. Just make sure you skedaddle before the after-work drinks crowd shows up — or, join them. This year-old Rogers Avenue cafe has two major points going for it: lots of space and killer pie. Order a piece from the rotating selection of pies and baked goods (all made on premises) and then grab a spot inside the wide open shop or in the back garden, where you can almost always find a seat. The appropriately named Sit and Wonder cafe is a delight for the lucky worker who snags a seat there in the morning. Playlists are always on point (Otis Redding and the White Stripes? Yes, please! ), coffee is strong, customers are very quiet and the garden space in the back is lovely, if a bit compact. Recommended: grab new reading material from their adorable book swap shelf. It’s only been a couple of months since Tekoá opened its doors in the former “Ted & Honey” space but the cafe is fitting right into the neighborhood. Picnic-style tables on the sidewalk will let you relax outdoors, though it might get a little distracting if Cobble Hill Park across the street is crowded. And make sure you show up hungry. The breakfast and lunch options from Chef Alex Raij, of “La Vara” fame, will not disappoint. This tiny cafe is probably the friendliest spot in the neighborhood. There’s space for only a lucky few in Roots’s back garden but the sunny spot is the perfect place to find some peace and quiet while you work. This cafe has a low-key exterior that’s easy to cruise right by, but step inside and you’ll find friendly service and tasty avocado toast with feta cheese. There’s a roomy covered sun room in the back and a sliver of a garden along the side for quiet outdoor work. This list was compiled by DNAinfo's Brooklyn reporters Leslie Albrecht, Camille Bautista, Gwynne Hogan, Rachel Holliday Smith, Alexandra Leon and Nikhita Venugopal.